This Video Is Going To Melt Your Heart Right Out! Check It Out! Before we can adopt a puppy, it is crucial that we do our research first. Puppies are hard work in and of itself – it will be a very big responsibility to take one home to raise. And, if you don’t know what kind of breed it is, it can get even harder! 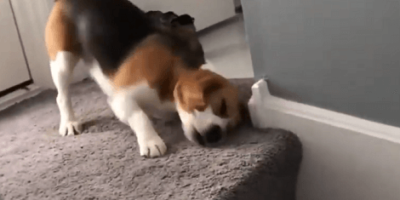 Beagle puppies like this one may be irresistibly cute, but they can also be very hard to handle. These pups, after all, were originally bred to hunt! Not that you can quite see the hunter in the way this puppy is twisting and stretching adorably on the stairs. Give it time – they will get there. Because of this, it is a good idea to arm yourself with information about that history and characteristics of the breed, so you can prepare for them appropriately. And that is where this video comes in – to help teach any interested future parents! This Adorable Pup Is About To Experience An Easter Egg Hunt For The First Time Ever!